This cleverly unique wedding invitation has your wedding guests literally helping you tie the knot. 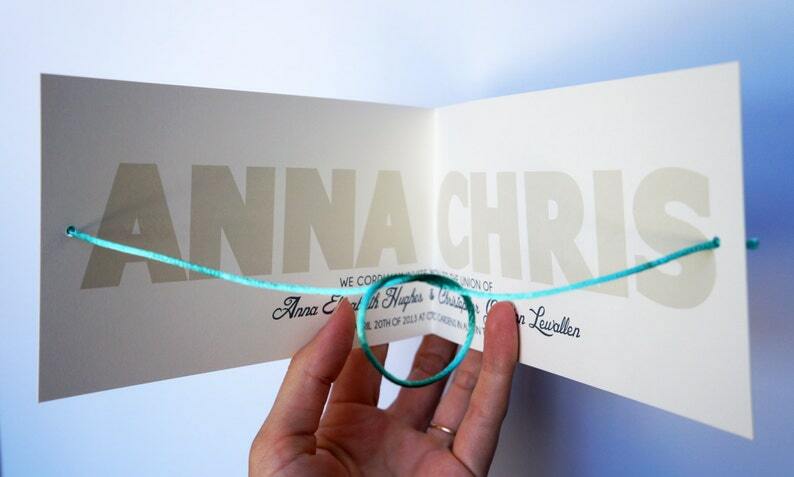 The invitation is mailed with a loosely tied cord on the inside, then as it is opened, it pulls tight to tie a knot. This invitation is simple, elegant and so much fun. If you would like to purchase the RSVP card in addition to the informational card, you may do so for $1.00 each. This invitation is a high quality print on super thick 110lb smooth natural white card stock. The cord used is 2mm thick, smooth and satiny. This invitation can be fully customized to fit your personality. You will be able to choose the color envelope and cord, as well as any changes in wording colors. Having an interactive invitation will be so fun for your guests to receive. Each invitation set is priced at $3.50 each. There is a minimum purchase of 25 invitations. You may place your order directly from this Etsy listing. This includes a proof and full printing rights to your invitation. *This will be a digital version only, you will receive no printed goods. Which means there is no shipping.